Future crisis management systems need resilient and trustworthy infrastructures to quickly develop reliable applications and processes, apply fusion techniques, and ensure end-to-end security, trust, and privacy. 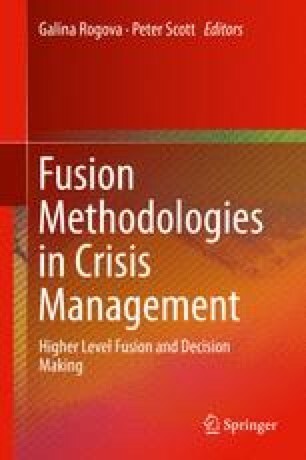 Due to the multiplicity and diversity of involved actors, volumes of data, and heterogeneity of shared information; crisis management systems tend to be highly vulnerable and subject to unforeseen incidents. As a result, the dependability of crisis management systems can be at risk. This chapter presents a cloud-based resilient and trustworthy infrastructure (known as rDaaS) to quickly develop secure crisis management systems. The rDaaS integrates the Dynamic Data-Driven Application Systems (DDDAS) paradigm into a service-oriented architecture over cloud technology and provides a set of resilient DDDAS-As-A Service (rDaaS) components to build secure and trusted adaptable crisis processes. One service presented includes the fusion of information from human observers and surveillance systems to assess the credibility (trust) of a crisis alert. The fusion trust service within the rDaaS also ensures resilience and security by obfuscating the execution environment and applying Behavior Software Encryption and Moving Technique Defense over the users, machines, and communication network. A simulation environment for a nuclear plant crisis management case study is illustrated to build resilient and trusted crisis response processes. This work is partly supported by the Air Force Office of Scientific Research (AFOSR) Dynamic Data-Driven Application Systems (DDDAS), AFOSR FA95550-12-1-0241, National Science Foundation NSF IIP-0758579, NCS-0855087, and IIP-1127873, and Thomson Reuters in the framework of the Partner University Fund (PUF) project (PUF is a program of the French Embassy in the USA and the FACE Foundation and is supported by American donors and the French government).